A budget conscious workhorse that keeps you on the move. Lift-Rite North Central has a wide variety of Lift-Rite® parts - wheels, rollers, bearings, bushings, seal kits, packing kits, valve kits, rebuilt hydraulic pumps, pushrods and frame parts. Parts for Lift-Rite® Hand Pallet Trucks, Parts for Ergonomic Lifts, and Parts for Straddle Stackers. ORDER ONLINE or call 1-888-778-5438. Lift-Rite® has a reputation for providing top quality and dependable material handling solutions. Hand Pallet Truck features include an easy pull loop handle, fingertip control level, and nylon wheels for increased rolling ability. Call 1-888-778-5438 to order new Lift-Rite® Pallet Trucks or Ergonomic Lift Parts. 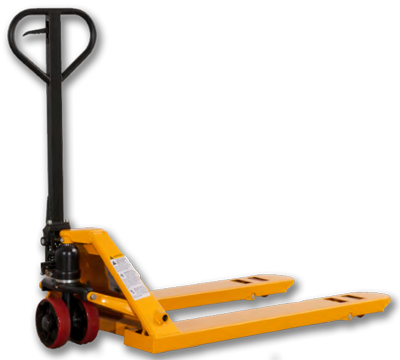 Eliminate damage from runaway pallet trucks. Awarded Heavy Duty Trucking's "Nifty 50" as one of the top innovative products in the trucking industry for 2005. We make it easy for you to find and order the parts you need for your Lift-Rite® Hand Pallet Truck, Ergonomic Lift, or Straddle Stacker. Whether you need schematics for your pallet truck or need help finding your serial number, our website can help. To find the schematic, click on the parts links for Pallet Trucks, Stackers, or Electric or Manual Ergos and locate your model. There you'll find not only the schematics, but also an easy-to-use online order form. If you prefer, you can always call Toll Free (in the US and Canada) 1-888-778-5438 to place your order. Call Toll Free (in the US and Canada) 1-888-778-5438 to place your order.